After six weeks on the road, it’s been delightful to settle back into life in the states with family and friends and have much more consistent access to a kitchen (or rather, my friends’ kitchens). Upon discovering some old frozen bananas in my mom’s freezer, I decided it was necessary to bake a new type of banana bread right then and there. 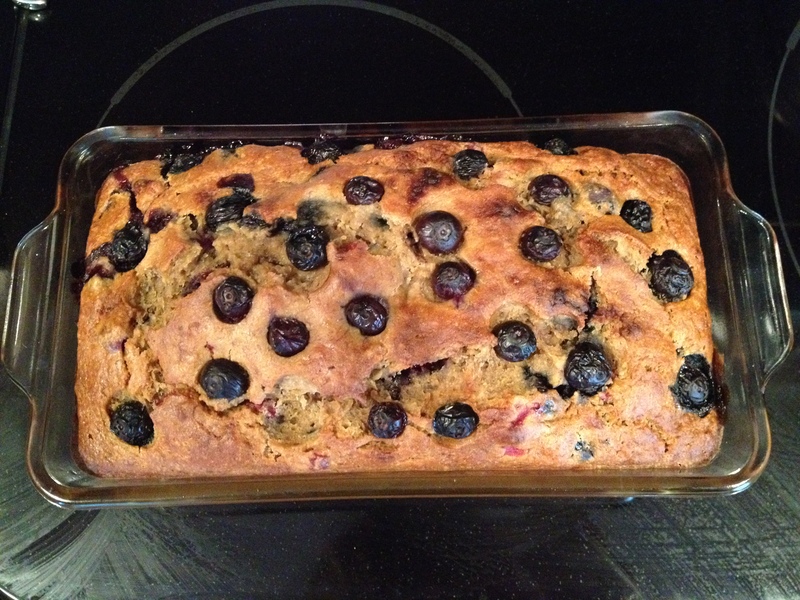 I wanted to make use of fresh berries and also the delightful fact that frozen cranberries are plentiful here, so I decided to go with a berry banana bread. I looked through a couple of recipes and kind of combined them at will. 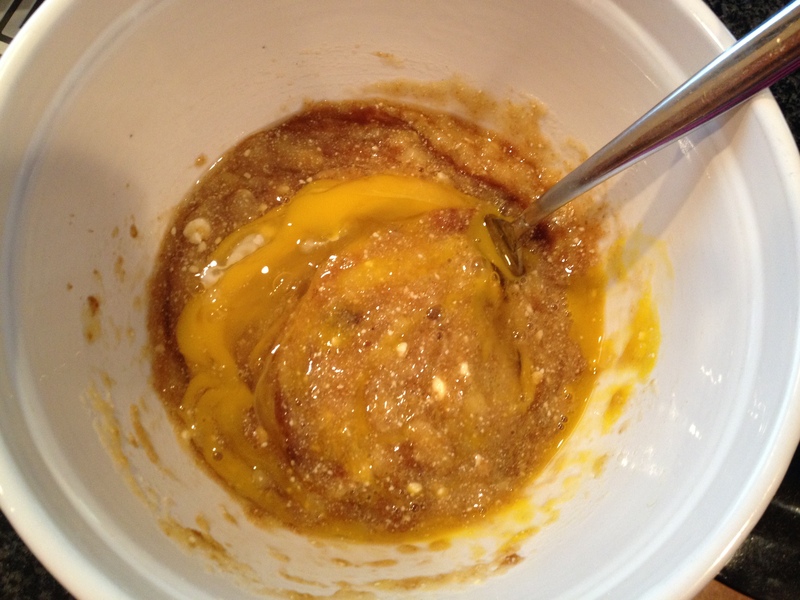 The recipe below was modified from one that was actually fully gluten and sugar free, but I added some gluten and sugar. I didn’t have quite enough applesauce so I also put in a bit of butter, but if you have 3/4 a cup of applesauce you actually don’t need butter or oil at all. Grease a rectangular loaf pan and preheat the oven to 350º F or 180 C. In a large bowl, mash up the bananas. If they are frozen, you have to let them defrost before peeling them, and then make sure to drain any extra water out of the bowl before mashing them. 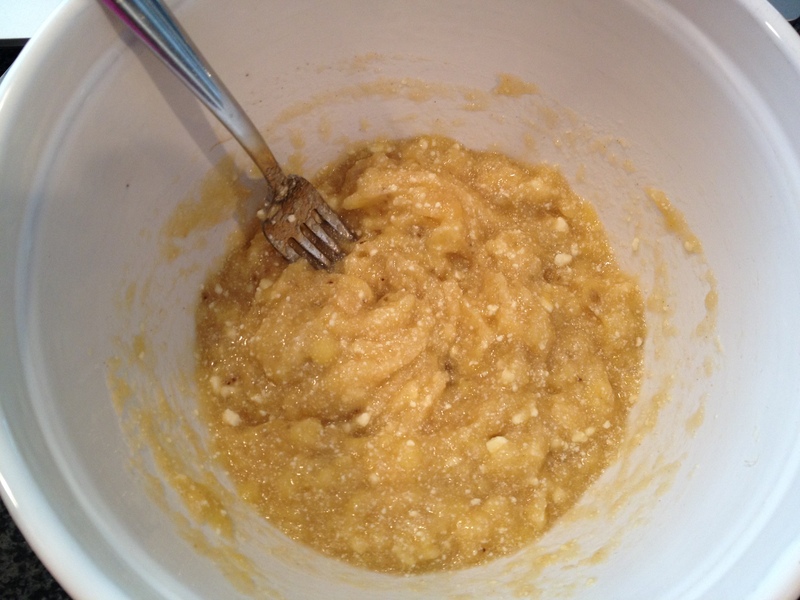 Add the applesauce, butter, vanilla, and eggs and make sure to thoroughly mix and combine. 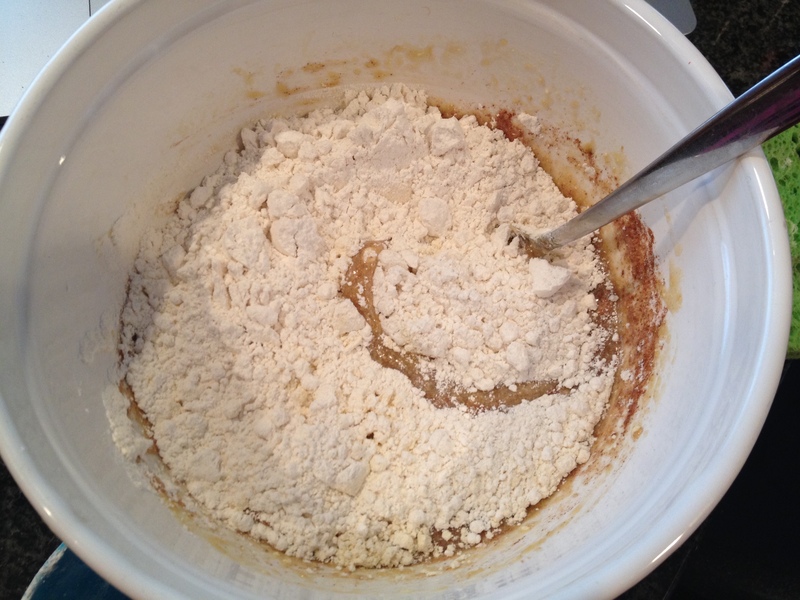 Then add your salt, baking soda, baking powder, and cinnamon, and finally fold in the flour gradually. The batter should be thick but definitely still easily able to scoop into a pan. As a last step, add the blueberries and cranberries. I added a handful of chocolate chips as well because you know, chocolate makes everything better. 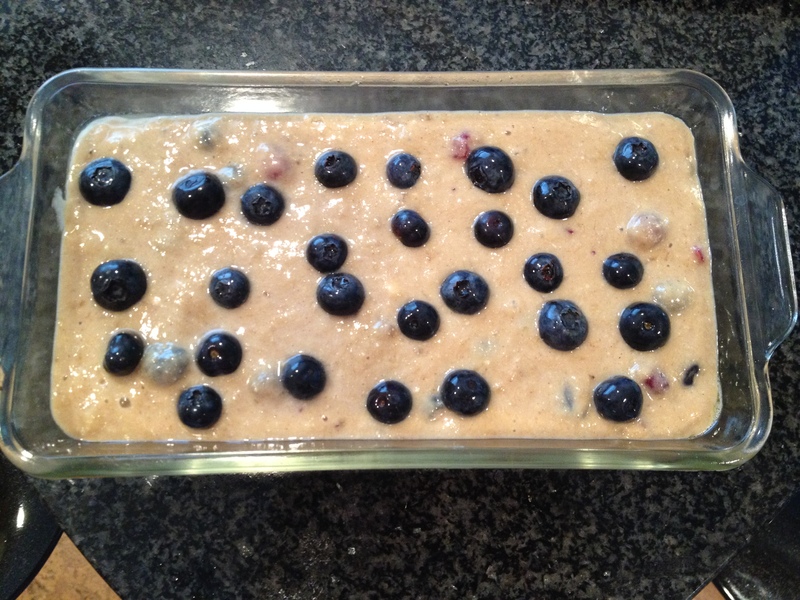 When everything is just combined (don’t overmix at this stage), spoon the batter into the prepared pan, and top with a handful of blueberries. The only problem with making banana bread in a loaf pan (you can always put it in muffin or mini muffin tins as well) is that it just takes forever to bake. Depending on how fast your oven cooks, it could take as little as 65 minutes or up to 90 minutes. I suggest you start checking for doneness at 60 minutes – a toothpick or knife inserted into the centre should come out clean or with a few crumbs attached (but definitely no batter). However, it will definitely start to brown on the top before 60 minutes is up, so at about 40 minutes, cover with aluminum foil, or sooner if you feel the top is browning pretty fast. It doesn’t mean it’s done though. As hard as it will be to do, you have to let it cool for at least 10 minutes before cutting, because honestly the flavors actually do taste better after cooling. It does taste fantastic when it’s still warm, obviously! It can be stored for a few days wrapped in plastic wrap but honestly it’s not going to last that long. This was one of the best banana breads I’ve had in a while, hands down. And honestly, it’s much lighter on butter than the typical banana bread and doesn’t have tons of sugar either – plus the tartness of the cranberries definitely balances out what sugar there is in it. I was basically eating this for breakfast, snacks, and desserts. It’s incredibly addictive. You really can go wild with variations though – put in raspberries or strawberries, add some toasted coconut to the top, have more or less chocolate chips – banana bread has so many delicious possibilities!